How do I configure my emule client? I can't get on any servers! How do I post a share? What do the red / blue / black bits mean? Why do I see HHAH in people's names? Windows XP firewall, good or bad? I have a router/firewall, what ports need opening? When I click a link I get an error. I am using Opera, how can I get clickable links? None of the links on this site, link to a file on one particular server, but rather points to a file shared by one or more users on the P2P filesharing network, which is accessed via a variety of clients using the ed2k protocol. To download, you must have a compatible client program installed and running. There are several other clients that can operate on the ed2k network under various operating systems, for *nix, Mldonkey and aMule seem popular. Firstly, the incoming files location is where the downloads will go once they have completed. Set this directory to a suitable place. Similarly, the Temp files are the files to which data is stored as they are being downloaded. You need a location with enough space to download. Finally, set up some shared directories, checking a box next to a suitable directory. DO NOT share system files, or stupid locations. This slows down connections to servers. Simply share a couple of decent movies you have downloaded. 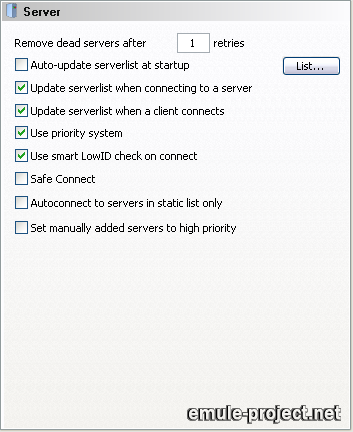 There are one of two possibilities, firstly if you have no servers listed then you need to attain a new serverlist, for example, this one here. If you have servers on your list but can not connect, check your port forwarding and firewall settings. Load up emule, go to preferences and then directories. Share the directories with your files in. Click second button on the the file and give the file release priority. 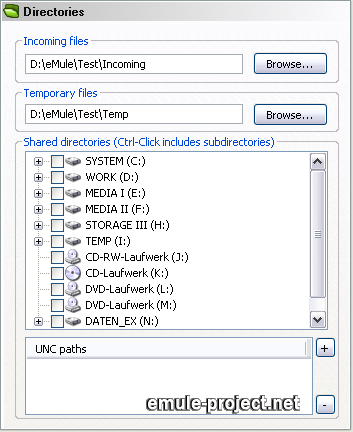 If your emule version supports powersharing, repeat and add powersharing. This will enable people to get through your shares and download. Now click second button on the file again, and go down to "Copy ed2k link to clipboard (HTML)". NOTE: in new emule clients you have to right click, then go to "Show ed2k links", and then hit "copy to clipboard"
Prefixing HHAH before your name is the preferred way of doing this, this way username lists can be ordered and lots of people who are kown can be found that way and you can give them friend slots in emule. HHAH username, has this advantage, but username [HHAH] does not, as this would be listed under U instead of H. Many mods have identification for these clients, by going into the advanced options and adding the string to the option. The option is normally under "extended settings", "mod preferences" or under another tab to similar effect, in the case of sivka it is under "sivka preferences". In the community string box enter HHAH, to use it. Why HHAH? Well people who have been with the site will know that before registering the domain name dead-donkey, the site was known as Horror Has A Home many, many years ago. HHAH as a reference to the site has stuck, even though the url has changed. IMPORTANT: All XP users, Internal Firewall Must be disabled. This useless 'feature' stops your mule from communicating with any other computer. It *must* be deleted. To do so, click second button on Network Neighbourhood, go to properties. Now locate your internet connection. On this click second button>properties. Go to the last tab, and uncheck the first check box. This will disable the firewall. Alternatively, if you have a mod that supports uPnP or XP firewall compatability, you can set it to automatically the required ports. If your worried about not having a firewall don't be, winxp's firewall is particularly lousy, your better off with a software firewall like kerio (emule search for it). Avoid ZoneAlarm, it causes no end of problems. The following list shows the ports used by eMule when using it's default settings. If you change anything in Preferences -> Connection you will have to take the changes into account when configuring your firewall or router. Note: 4661 is the default port of a server. Many server use different ports. Configuring a firewall the remote port again changes to any. Note: Servers using the default port 4661 TCP (see #5) automatically set their port for source asking to 4665 UDP. If a server uses a different port in #5 the corresponding UDP port is set to [Connection Port + 4]. For firewalls the remote port here is any. UDP is a connectionless protocol, i.e. unlike TCP no connection is kept alive. If a server answers e.g. a source request this answer is treated as a new connection. 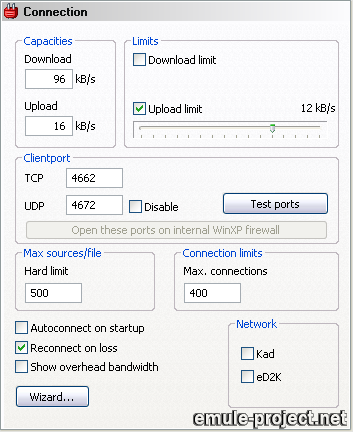 All commonly used routers and firewalls in the home computer sector perform an UDP connection tracking therefore it is not necessary to specify an incoming port for UDP in the router's or firewall's configuration. More complex networks, especially if proxy servers are used, may require to define this local port to configure the router / firewall / proxy accordingly or to disable it at all if it is not possible to control them. It is possible to set this port in Preferences -> Preferences.ini but there is usually no need to change it. Note: This is the default port for the web interface. When using a router this port has to be forwarded or no connection to the web interface will be possible. Opera 7.20+ requires you to add this in the preferences area now. Your action should point to the location of your edonkey client's executable.